These action civics projects are the result of an uncommon collaborative between school teachers; park, refuge or nature center managers; stormwater engineers, utility staff, or local government staff; and environmental education designers. While each municipality has a solid core that’s the same, each program, based on the students and adult leaders (teachers, resource people) responds to its resource place. Albuquerque’s KIC-NET uses an urban wildlife refuge as an outdoor laboratory, tying lessons back to school campuses, barrios, and the Middle Rio Grande watershed—the goal being water quality improvement as part of the Urban Waters Federal Partnership in Albuquerque. At the Denver site, Huston Lake Park, fifth-grade students at nearby Mathematics and Science Leadership Academy conducted a series of water quality tests of the lake, created a brochure about new water quality features and delivered them to households in the lake’s drainage basin, informing neighbors about stormwater and green infrastructure. In three other Denver neighborhoods, students planned and hosted water festivals for their fellow students, families, and neighbors. They presented concerns about clean water to elected officials, and produced and showcased an exhibition of field guides. Investing in campaigns and outreach to target youth audiences is an effective strategy to both amplify the organizational message and, in effective programs, overcome barriers to community-wide civic action. With 82% of teens (ages 12-17) online and 50% utilizing social media, plus another 21% of kids under 13, having a message and mission that is tailored to youth is one of the most effective ways to build a larger audience. The “youth voice,” defined as youth who become involved in their community , actively influence other participants in the community and help solve community problems. By connecting to city and community partners, students become confident civic leaders and environmental stewards. Mutually beneficial goals of municipal stormwater management and school administrators and teachers allows leveraging of resources for both; they go farther together than they can go alone. 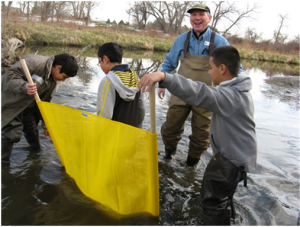 Editor’s Note: Earth Force, an EPA Urban Waters grantee, received the Colorado Alliance for Environmental Education’s 2014 Environmental Education Award for Excellence in the “Best New Program” category. Curriculum resources are located on the Earth Force website. Earth Force is a national non-profit organization that engages young people as active citizens who improve the environment and their communities now and in the future. Through Earth Force and their network of diverse partners, young people get hands-on, real-world opportunities to practice civic skills, acquire a deep understanding of the environment, and develop the skills and motivation to become lifelong leaders in addressing community issues. Earth Force is a leader in networking community partners, training local groups, and providing curriculum resources to run service-learning and action civics programs in communities across the United States and Canada. Stacey Eriksen. EPA Region 8.